Hawaii has become a cruise destination in turmoil. Its biggest champion, [% 12025 | | Norwegian Cruise Line %], will pull two of its three U.S.-flagged ships out of the all-Hawaii market before summer 2008. Plus, the U.S. Customs and Border Protection (CBP) has proposed a change to the Passenger Vessel Services Act, which may prevent foreign-flagged ships from sailing Hawaii cruises altogether. Given that Hawaii appears to be the perfect place for cruising—beautiful scenery, diverse excursion options, short distances between islands, fabulous weather—the question that comes to mind is: What’s the problem here? Although NCL made a concerted effort over the past few years to invigorate Hawaii cruising with three U.S.-flagged ships able to sail all-Hawaii itineraries, the operation has been losing money because of high operating costs, lackluster bookings, and weak pricing. As a result, Pride of Hawaii was recently re-flagged and renamed (Norwegian Jade), and will transfer to the more lucrative European market. The older Pride of Aloha was deemed undeserving of the expensive Freestyle 2.0 upgrades and will be transferred to parent company Star Cruises this spring. Only the Pride of America will remain as the sole U.S.-flagged ship sailing year-round, seven-night itineraries in the islands. And unless that ship starts raking in major cash, NCL isn’t planning on adding another U.S.-flagged vessel to its fleet. If the ship does poorly, some industry watchers think it could potentially drop Hawaii cruises altogether. To make matters worse, a potential change to the Passenger Vessel Services Act might drive all foreign-flagged ships out of Hawaii entirely. Most cruise lines register their vessels in a foreign country so they can employ international crewmembers, sail foreign-built ships, and avoid U.S. labor laws. These ships, under the current ruling, must call on at least one international port when transporting passengers between U.S. destinations. This makes a round-trip cruise from Honolulu impossible because all the Hawaiian Islands are part of the U.S. In order to offer Hawaii cruises, lines such as [% 15420 | | Royal Caribbean %], [% 14665 | | Celebrity %], [% 11986 | | Carnival %], [% 14460 | | Princess %], and [% 9823 | | Holland America %] are forced to sail round-trip from California ports with mandatory visits to Ensenada (the closest non-U.S. port) or offer one-way trips between Honolulu and Ensenada or Vancouver—not the most convenient of routes. However, the proposed amendment, if passed, would mandate that foreign-flagged ships spend at least 48 hours in a foreign port and that the amount of time spent at the foreign port be more than 50 percent of the cruise. It would be next to impossible for foreign-flagged cruise lines to abide by these rules and still give guests enough time in Hawaii. The result would be mayhem on Hawaii’s cruise business, as the only ships left would be the Pride of America and foreign-flagged ships that stop in the islands for a day or two on a longer cruise elsewhere in the Pacific. With or without CBP interference, Hawaii is not the most popular of cruise destinations. Aside from NCL, Holland America and Princess are the only lines to have dedicated Hawaii seasons. 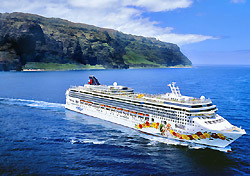 The two lines offer two-week-long itineraries from California homeports each year between September/October and April. Carnival, Celebrity, and Royal Caribbean offer a handful of island cruises each year, but these are typically one-way repositioning sailings as ships transition between Mexico or the far Pacific and Alaska itineraries. But Hawaii really is ideal for seven-night, port-intensive itineraries. The islands are close together, but each offers a different experience and personality. Excursion options are endless with beach breaks, volcano tours, whale watches, surf lessons, and cultural events. The islands are breathtaking when seen from the water. Even better, Hawaii is in America—it’s safe, the people speak English, and the dollar is accepted everywhere. And families and young couples without two weeks to spend on vacation want an itinerary option that’s short and sweet. So why aren’t more lines adding cruises to the island state? It’s a combination of law and demographics. Current law prevents foreign-flagged ships from sailing seven-night all-Hawaii itineraries so every line but NCL America can only schedule 10-night or longer cruises involving stops in Canada or Mexico. Representatives from Celebrity, Holland America, and Royal Caribbean say these cruises are popular with older, more experienced cruisers. These travelers have the time to take a two-week cruise and are at the stage of life where four days at sea in each direction are more relaxing than boring. However, there are just not enough of these vacationers to warrant additional Hawaii departures. Erik Elvejord, a spokesman for Holland America, told us that he doesn’t expect to see HAL’s Hawaii itineraries change drastically until the demographics of the U.S. change and the baby boomers are in their 70’s with plenty of time and money. Then perhaps we’ll see more of the longer island voyages to satisfy the desires of mature, experienced travelers. That leaves NCL’s seven-night voyages as a unique product in the business. No other line offers such a port-intensive Hawaii itinerary. And, NCL is the only line sailing the islands in June, July or August. With no direct competition and a spectacular destination tailor-made for cruising, the cruise line should be laughing all the way to the bank. According to Mike Driscoll, editor of Cruise Week, a weekly travel-agent oriented publication, a combination of obstacles stands in NCL’s way. The first is the laws that prevent foreign-flagged ships from cruising Hawaii. In order to sail seven-night Hawaii itineraries, NCL needs to staff U.S.-built ships with American citizens. Therefore, the cost to operate these cruises is much higher than with foreign-flagged ships because Americans demand higher salaries than workers from developing countries. Plus, American laws forbids onboard casinos and forces the line to charge sales tax for everything sold onboard with the result that onboard revenues are lower. Because of these factors, NCL needs to make more money in order to turn a profit. To make matters worse, Freestyle Cruising—NCL’s signature laidback philosophy—is extremely service intensive. Sure, it’s got the appeal of offering cruise travelers the ultimate in flexibility, especially with multiple boutique eateries serving dinner at any time. But, more restaurants mean more wait staff, and more efforts devoted to handling reservations and waiting guests. Plus, no set dining or evening schedules make it hard for cabin stewards to have a structured work schedule—they can’t anticipate when you’ll leave your cabin and when you’ll come back, so they have to guess at when to come in and clean. With so many service challenges and an inexperienced staff ill-suited to the task, the quality of service on the NCL America ships just can’t compare to what’s found on NCL’s foreign-flagged ships. And so people complained. Not everyone, but enough. “The majority of people seemed fine with the service,” reports Driscoll, “but experienced cruisers expect a certain tidiness and there were more than the usual complaints.” The disappointed cruisers blamed not only NCL but also their travel agents for recommending a sub-par product. And though first-time cruisers may not have heard of the Pride of Aloha’s maiden-season service issues, the reality is that agents, dependent on repeat business for their livelihoods, are hesitant to promote NCL Hawaii cruises to their clients. According to Driscoll, travel agents booked more than 90 percent of NCL’s first Hawaii season, so their hesitation really hurts. The only way, it seems, that Hawaii can truly invigorate its cruise business is to allow foreign-flagged ships to sail Honolulu roundtrips on a limited basis. But that’s not the way things are headed. Until Hawaii’s Senator Inouye, who was a major force in awarding exclusive access to NCL in Hawaii, changes his mind and lobbies for foreign-flagged cruises, or the CBP gives up on cabotage laws, NCL’s Pride of America will go it alone. And for the time being, that’s not a bad thing. A reduction in capacity will take some of the pressure off NCL to fill three entire ships and allow it to stop discounting prices so severely. The creme de la creme of American crewmembers can work toward eliminating some of the line’s service issues. Cruisers will still have a choice between seven-night all-Hawaii itineraries and longer round-trip or repositioning sailings. Perhaps someday Hawaii can become the top-notch cruising destination it’s meant to be. But, much to NCL’s chagrin—as well as the cruisers, business-owners and job-seekers who want to see Hawaii cruising succeed—that day is still a long way off.